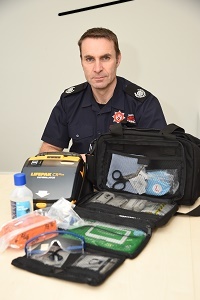 A new medical kit is going to be rolled out by Hampshire Fire and Rescue Service to all fire officers in the county to enable them to save more lives than ever before. HFRS will be giving additional training to all of the people who are being allocated the new medical bags next month. The new bag will contain a defibrillator, a pocket resuscitation mask, thermal blankets and a variety of dressings and will replace the basic first aid kit previously carried in all officer vehicles. About 60 of these new medical kits will be given out to officers, up to and including the Chief, to get these life-saving tools into the community. Hampshire Fire and Rescue Service has also recently finished placing Immediate Emergency Care (IEC) enhanced medical bags, also containing a defibrillator, on all 85 fire engines across the county, giving our firefighters enhanced knowledge and tools necessary to start treating casualties at the incidents they attend, ahead of the arrival of an ambulance. Station Manager David Heybourne said: “We now have IEC enhanced medical bags on 85 fire engines and in 19 of our co-responder vehicles. With these additional 60 officer bags, this makes a grand total of 164 extra bags of medical equipment with added provision of suitably trained medical fire personnel to assist with any situation”. Hampshire Fire and Rescue Service's Fire as a Health Asset team is also involved in preventative projects such as the pioneering STEER programme, an exercise class for the over-65s which reduces the risks of a fall, and has received plaudits from geriatricians. They also run the A Better Me scheme to promote healthy living among youngsters through a variety of fun activities.